On the hunt for a new RAM 1500, the competitive Jeep Cherokee – or even the luxurious Chrysler 300? Look no further than the new vehicle inventory at Midway Chrysler Dodge Jeep RAM, serving drivers in Kearney, NE. Here, we have 131 new vehicles in stock – many of which quality for special offers and discounts. So, once you’re ready to upgrade your Grand Island restaurant outing to the next level, simply schedule a test drive today! We’re ready to help drivers around Nebraska find the new car that best suits their needs and their budget. Why Choose Midway CDJR for My Next New Vehicle? 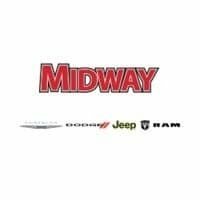 There are plenty of reasons why Grand Island drivers choose Midway Chrysler Dodge Jeep RAM, not least of which is our vast inventory. It’s not simply that we’re confident that at least one of our 131 new cars will accommodate your needs. Rather, we’re here to deliver a no-hassle experience – one that prioritizes your unique needs and preferences first and foremost. Plus, we’re here to help you after you’ve left our lot! You can rely on us for car detailing services, as well as our service department when routine maintenance comes along. Ready to get started in leasing or financing your next Chrysler, Dodge, Jeep, RAM? Contact us today.